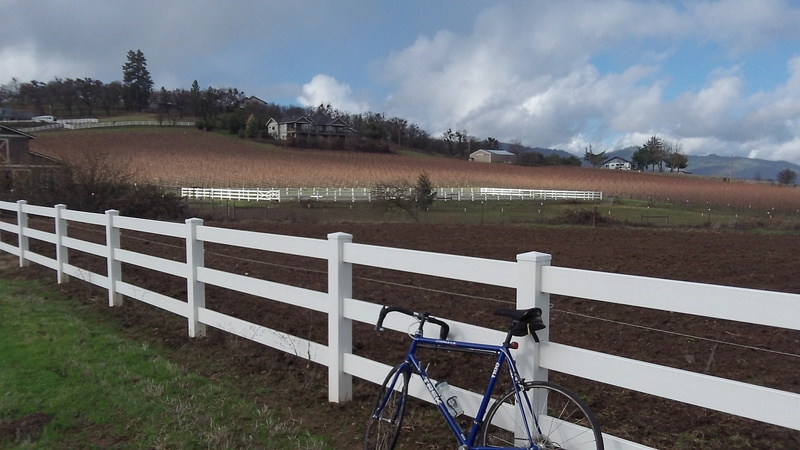 A Southern Oregon pasture and vineyard in winter. There’s nothing like a break in the clouds when for days we’ve had nothing but dark skies and rain. You appreciate it even more when you’re on a bike ride in December, on a road bike that has no fenders and no place to put them. 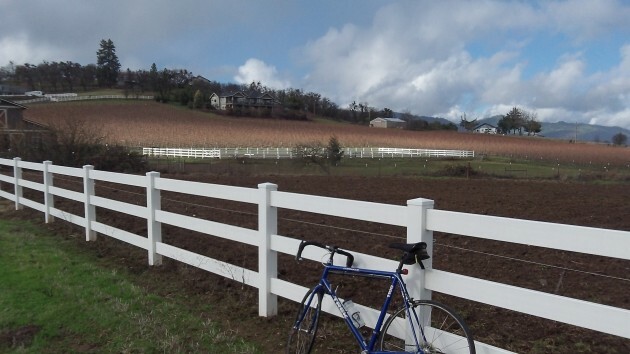 My usual bike route out of Jacksonville in Southern Oregon takes me through the countryside outside Medford, where many vineyards have sprung up in recent decades. In the 1960s and ’70s, the main crop of the Rogue Valley was pears. Now many of the pear orchards are gone. I don’t know the reason for the change and assume it has something to with the economics of agriculture. Or maybe pear growers got tired of spending many sleepless nights in the early spring, worrying about frost killing the budding fruit and thus that season’s crop. As far as I know, springtime cold is less of a problem for grapes. But back to the here and now. The forecast is for rain followed by rain on the coast and in the valleys, with snow in the Cascades. And it’s not even winter yet. Most of Oregon was in drought conditions just four months ago, if not less. This cold and wet start to winter may yet change for the worse. All the seasons seem earlier than elsewhere. Crocuses and daffodils usually bloom much earlier than in places like Virginia. There are seasonal climate graphs which clearly show the odd rapid drop and early, slower rise in temperature.